Agnes, aged 19, received a grant from Hope for the Young’s Education  Fund to study at university. However, aged just 4 years old, Agnes  found herself in a new country, thousands of miles from her  family  home in The Gambia. Life in Dagenham, East London,  has been far from easy for Agnes and her family. “I have overcome many challenges whilst being in the UK. From being in a four-year battle with the Home Office  in order to obtain our leave to remain, to my most recent challenge – getting into university.” Even though Agnes has been living and studying here for nearly 15 years, she discovered to her amazement that she was not able to continue her education as she was not eligible for student finance. 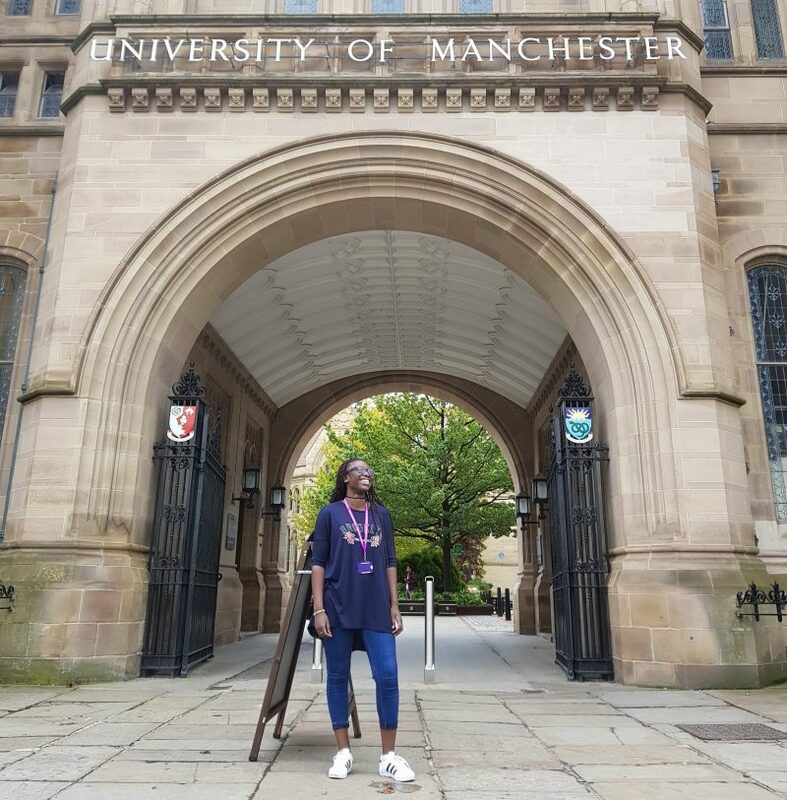 She had studied very hard and met her conditions for university, resulting in a place at the prestigious Manchester University to study Physics. But it was a hollow victory because she was told that she was ‘ineligible for student finance’ and therefore unable to pay for her tuition fees. Agnes found herself, as so many of those that Hope for the Young supports, stuck in a limbo. “I had gotten the grades and the place, so why couldn’t I go?”, Agnes says in frustration, “It made me very upset and angry. The fact that all my peers and friends were able to progress to the next part of their lives and I was stuck not knowing when I’d be able to do the same was extremely difficult for me.” Despite these challenges, however, Agnes remained resilient in the face of adversity and continued pursuing her dream. ‘The sky is the limit’  bore no significance to Agnes as she had her heart firmly set on the stars. Like many other students faced with a similar predicament, Agnes was forced to take a gap year to reconsider her situation. It was then, by chance, she met a previous grant recipient of  Hope for the Young who encouraged her to apply. Sure enough, a few weeks later Agnes received an email confirming her application had been successful and, to her utter surprise, she was granted enough money to begin her first year at university. “This has given me the opportunity to gain the necessary qualifications to pursue my dreams”. Despite the help from Hope for the Young, her battle is still ongoing. “I still face the challenge of paying for the last 2 years of my course.” She also must wait 10 years (of which she is 3 years in) to become a British Citizen before she even has the chance of becoming an Astronaut. Regardless of these set-backs, Agnes is still full of energy and determination. After her degree she plans to continue in academia and do her PhD. “I want to do research, specifically towards doing something about climate change.’ Ambition with plans to change the world, Agnes is an inspiration to all young people facing difficult circumstances. Full of positivity and determination, Agnes brings dynamism and hope to all young people everywhere. The team here at Hope for the Young will continue doing all we can to help people like Agnes reach for the stars, but we would like to say thank you to her for being such a great example to us all.